Despite the downturn in both the civil engineering sector and mining in recent years, Raubex Infra’s civils and mining division has been active in several projects across South Africa’s provinces. Bringing its usual combination of technical expertise and innovation, the division has been attending to contracts from sinkholes to roadworks, according to Cornel Strydom, operations director for the Raubex Infra’s civils and mining division. A five-month job to repair a sinkhole on the road between Danielskuil and Kuruman required the use of dynamic compaction with a falling weight. In this case, the sinkhole had many chambers, some which had to be filled with rock. By compacting the rock in columns, a rock platform was created over the columns to form a ‘bridge’ between the cavities. The layer works for the road could then be placed on this platform. The company was also recently required to stabilise the gravel road between Douglas and Campbell, and offered a solution that saved on future maintenance. “In collaboration with the client, we decided on stabilising the wearing course of this gravel road down to a depth of 150 mm by using a dust suppressant,” he says. The benefit of stabilising the current material in this way is that the dust suppression qualities of the surface remain as the material wears away. This effectively reduces the normal intervals between future spraying of dust suppressant as the road wears. In a smaller road project, at a private game reserve in Limpopo Province, both paved and concrete roads have been constructed and cables laid for internet connectivity. On the mining side, Raubex Infra conducted mass earthworks for a new run-of-mine tip structure and internal roads for a mine in the Western Cape, making use of a pugmill blending plant for mixing moisture into the gravel for road construction. “Some of the areas where material had to be placed were very confined, so it was not possible to mix water into the soil conventionally,” he says. Projects in the pipeline include a road rehabilitation and reseal contract between Vanzylsrus and Hotazel, a storm water pond at Lufhereng in Soweto, a water treatment project in Bloemfontein, a water pipeline project at Vanwyksvlei and a borehole contract at Carnarvon. As the market recognises the numerous benefits of dry-type transformers, specialist supplier Trafo Power Solutions has, in recent months, provided custom-designed units for a range of applications within South Africa and in other parts of the continent. According to Trafo Power Solutions managing director David Claassen, an increasingly popular application for their transformers has been in large industrial companies which leverage solar power to augment their energy needs during daylight hours. In another customised solution developed in response to a specific challenge faced by a customer, the company recently helped address the frequent voltage fluctuations in supply being experienced at the South African manufacturing facility of an international pharmaceutical company. 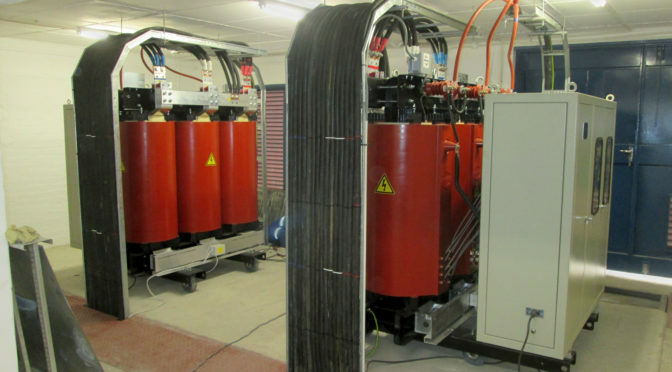 The supply and installation of two 1250 kVA transformers for this unique application was also completed in record time, including the commissioning and testing of the system within just three days of the units arriving from Hammond Power Solutions’ manufacturing facility in Italy. There has also been steady demand for dry-type transformers in commercial buildings and hospitals, where users are looking to ensure high levels of safety in relatively confined spaces, while enjoying low maintenance requirements. The absence of oil in the units gives them a higher safety rating than conventional oil-cooled transformers, and allows them to be installed indoors; users are also spared the cost of building special structures to accommodate the safety and environmental hazards related to oil-cooled units. The upgrade of standby power generating facilities on two of the Johannesburg campuses of a leading South African university have also included four dry type transformers supplied by Trafo Power Solutions. The four transformers, two 2500 kVA and two 1000 kVA units, will step up the power supply from 400 V to 11 kV. 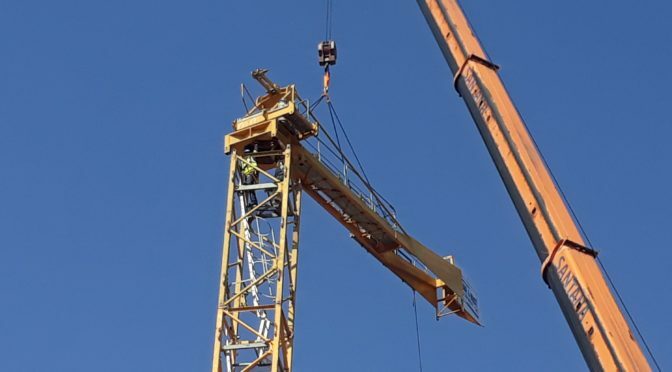 Louw Smit, sales director of Crane & Hoist Equipment SA, says that the company was able to offer the end user the most appropriate tower crane for the project and at the right price with full back up support over the duration of the eight month hire period. A Potain MDT 98 tower crane was selected for this particular project as it will provide a 1,2 t lifting capacity at a 55 metre radius allowing optimum materials movement on this fast track project. Significantly, this top slewing modular tower crane can be easily adapted for individual sites and brings optimum performance coupled with flexibility to a construction site. Smit that this particular tower crane was considered ideal for several reasons including that it is fast and simple to erect and that while it only requires a limited footprint it facilitates optimum reach on sites which are constrained. “This reach ensures enhanced productivity by ensuring that materials can be moved to where required with ease,” he says. Crane & Hoist Equipment SA was established as a specialist operation that supplies new and refurbished cranes as well as construction hoists to the sub-Saharan markets. The company provides turnkey tower crane management and lifting solutions, and demand for its services has rapidly gained traction. 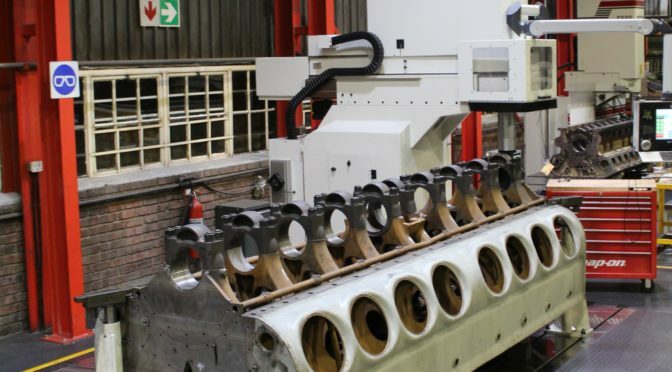 In an engineering first for South Africa, Metric Automotive Engineering in Germiston is conducting the full remanufacture of the two large locomotive engine blocks and oil pans on behalf of a large OEM customer based in the United States for an African rail operator. According to Andrew Yorke, operations director at Metric Automotive Engineering, the company is one of Africa’s most comprehensively equipped heavy diesel engine and component remanufacturers. One of the specific challenges of this contract is that the components are a fabricated mild steel construction, rather than the traditional cast iron. Mild steel is a softer metal with different wear characteristics and requires a different approach to machining, using specific tooling and tips. The size of the components also demanded machining equipment of appropriate scale and dimensions. “We invest regularly in up-to-date and fit-for-purpose machinery, so our facilities can refurbish large diesel engine components, as well as cylinder head remanufacture, cylinder block line boring, milling, honing and boring, camshaft grinding, crankshaft grinding, engine assembly and dynamometer testing,” says Yorke. The line bore on the first block was also out of specification in relation to the centre line, so Metric Automotive Engineering had to metal-spray the entire line bore to re-establish the centre line. This was a vital step without which the block would not have been repairable. 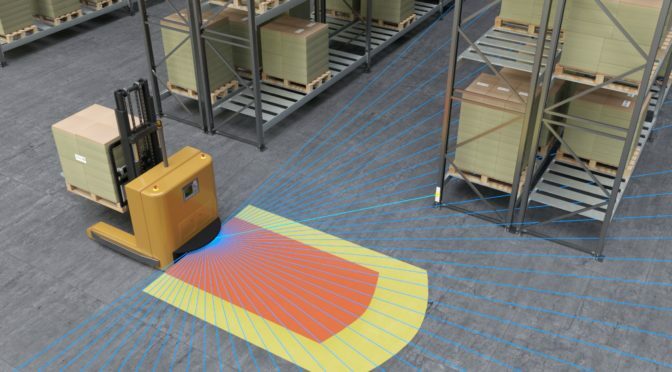 The Leuze RSL 400 safety laser scanner with measurement value output is setting new standards in the reliable navigation of automated guided vehicles (AGVs). Available from leading sensor solutions provider Countapulse Controls, the new Leuze RSL 400 safety laser scanner is the result of many years of experience in the development of safety technology. This compact safety scanner combines safety technology and qualitatively superior measurement value output in a single device. This enables reliable safeguarding and navigation of AGVs. Measurement value output is optimised to navigation software that functions according to the principle of natural navigation with SLAM (Simultaneous Localisation and Mapping). Due to its high angular resolution of 0.1 degrees, the Leuze RSL 400 offers extremely detailed scanning of the environment across the entire measurement range of up to 50 metres. This is achieved through a particularly narrow laser spot that maintains its perpendicular shape over the entire scanning angle. The distance values have a high accuracy and are not influenced by reflection of objects. The additional output of the received signal strength value for each beam allows autonomous detection of reflectors by the navigation software. When beams strike a reflector, the values differ greatly from any other environment, which facilitates reliable detection. With up to 100 switchable field pairs, the Leuze RSL 400 offers optimum adaptation of the protective fields, even in cases where there are many different movement and loading conditions. Parallel monitoring of multiple protective fields enables safe and reliable reduction of the speed of AGVs. These new functions are also available as a device model with PROFINET/PROFIsafe interface, thereby making integration extremely easy. Johannesburg-based Countapulse Controls offers industry access to skilled technical personnel that can advise on sensing solutions across a broad range of applications. 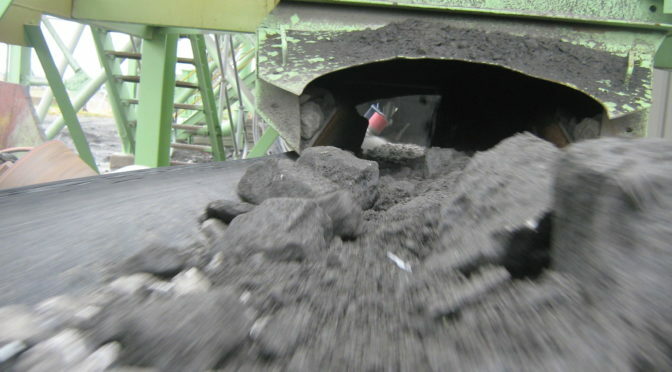 Adaptability is the watchword in FLSmidth’s Buffalo™ range of low-capacity modular reclaim feeders, making it a versatile offering for anything from run-of-mine applications by medium-tier miners to flexible stand-in units for larger operations when stacker-reclaimers require maintenance downtime. According to PC Kruger, FLSmidth’s account manager for coal in sub-Saharan Africa, the modular format allows different discharge heights and loading decks of various lengths to suit the required application. It also facilitates transportation of these units in standardised containers to remote locations, after being manufactured in a dedicated FLSmidth workshop. Depending on the application and the level of mobility required, the units can be mounted on skids or even wheels to be relocated from one position on site to another. This further enhances their versatility. The motor control centre (MCC) is located onboard the reclaim feeder and only the power supply needs to be isolated before relocating the unit. The modularity of the units also makes for easier logistics; rather than demanding the large lifting equipment for the conventional size of composite units, this range requires much lighter lifting capacity of just two to three tonnes. The economy of this design extends to manpower, as fewer artisans are required for assembly and commissioning. The heavy-duty design features replaceable individual parts throughout the full length of the feeder, which is powered by electromechanical and hydraulic drives. Flow control is achieved through adjustable hydraulics, variable speed drives and gearbox ratios. Pitch chains are available in 4 inch. The Buffalo™ brand of feeder breakers, introduced in 1975, became part of the FLSmidth group in 1999, changing its name to FLSmidth Buffalo™. The Buffalo™ acquisition has strengthened FLSmidth’s position as a market-leading manufacturer and supplier of feeders, feeder breakers and sizers. Manufactured in South Africa, FLSmidth Buffalo™ equipment is distributed globally. The Apex SR 9000 insulated impact traffic door is undoubtedly one of the more attractive heavy duty doors available on the market. Considered by many as the most cost effective answer, this door with its proven construction offers years of dependable operation while maintaining an attractive appearance. Add to this its minimal maintenance requirement, and it is clear why demand is increasing of this locally made door. The fully gasketed Apex SR 9000 heavy duty impact swing door is locally manufactured to customers’ specific requirements. 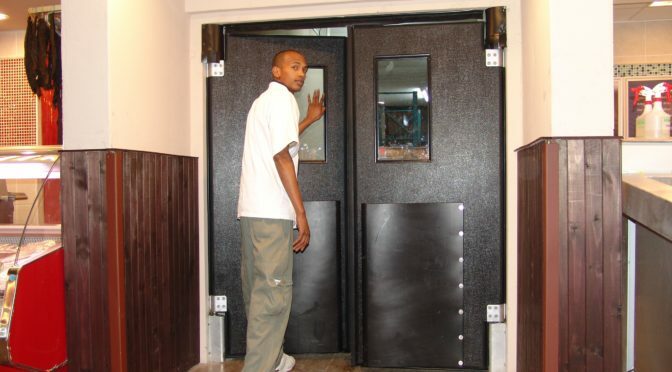 Its patented “honeycomb” framework and flexible urethane foam insulation gives the door optimum stability and superior soundproofing qualities. This is achieved by injecting high density non-CFRC urethane core into the hollow shell of the door. Lightweight but robust, the Apex SR 9000 door is engineered to withstand heavy traffic and impact. High bumpers are fitted to the door panel to further absorb impact from manridden vehicles and carts. This also reduces stress on hardware and mount assemblies. In addition, the perimeter edges on the door panels are bull nosed with a minimum radius of 8 mm preventing excessive wear on the edges. The seal complements the insulated core reducing energy flow between environments, another plus factor. The rugged 3 mm ABS outer facing of the Apex SR 9000 door is available in a variety of colours and it is impervious to moisture, acid, petroleum products, salt solutions, animal fats and insects. It retains its physical properties in temperatures as low as minus 40º C and it will not chip dent, peel, pit or corrode. The Apex SR 9000 is available from Apex Strip Curtains & Doors and its network of agents throughout South Africa who offer technical and installation support as well as prompt delivery times. Electric motor applications require a reliable, robust fit-for-purpose product that will give the end user the requisite low total cost of ownership. Fanie Steyn, manager responsible for rotating machines at Zest WEG Group, says it is encouraging that most industries in southern Africa have woken up to the fact that purchasing the standard efficiency motor is not the best long-term option. As the leading supplier of electric motors in southern Africa, Zest WEG Group offers the most comprehensive range of low voltage electric motors available on the continent. 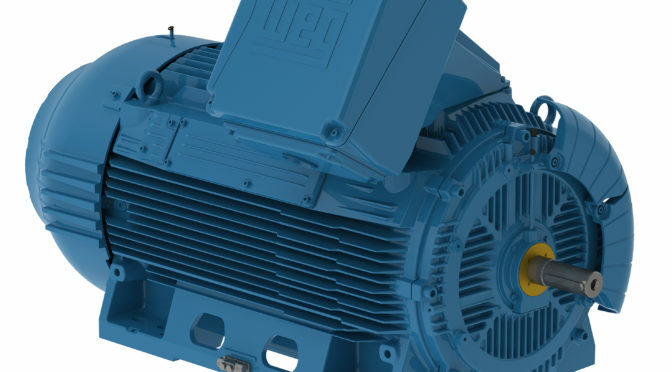 In previous years, all WEG low voltage electric motors were manufactured at WEG Brazil, but today this major group’s manufacturing network extends to four continents. All facilities adhere to stringent quality control processes, are ISO 9001:2015 accredited and motors meet all the requisite international standards and regulations. “The depth of the WEG low voltage range of electric motors allows us to offer customers the best fit for individual applications, and we are also able to draw from a product line-up of motors that are engineered for specific application requirements,” Steyn says. The WEG low voltage electric motor range starts from 0,18 kW motors that would be used to drive small fans or used in exhaust applications and goes up to 1,250 kW motors which would drive massive ventilation fans or pumps. Significantly, Zest WEG Group has such confidence in WEG motors that all the WEG W22 low voltage units now carry a five-year guarantee as standard. Electric motors for specialised applications would include slip ring motors, roller table motors, saw arbor motors, gas pump motors, pad mounted motors, smoke extraction motors, permanent magnet motors, cooling tower motors and wash down motors for hygienic applications. Zest WEG Group operates an extensive branch and distributor network ensuring easy access for customers across the sub-Saharan region. Steyn says customer demand across the region is carefully monitored and stockholding at its head office and branches is maintained in accordance with this to ensure the highest possible level of access to our premium product. The group’s nine strategically located branches in sub-Saharan Africa are supported by a team of skilled competent technicians in the field. Underpinning this support to industry, is the motor related product training offered by Zest WEG Group to its customer base. Material transfer problems can be addressed easily by considering basic chute specifications, but this necessitates a thorough knowledge of transfer point design as well as the ability to determine best practice for a specific application. 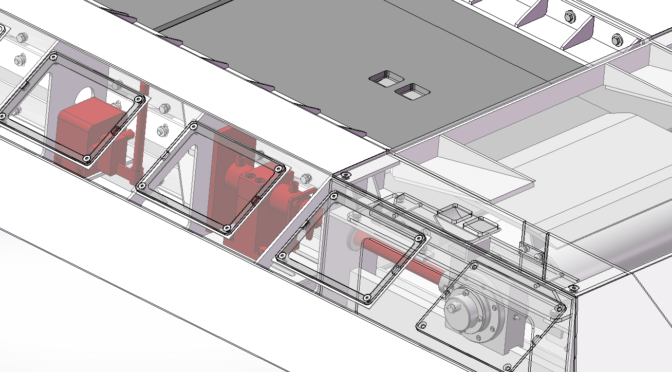 Mark Baller, managing director of Weba Chute Systems, says that in addition to this it is necessary to be able to custom engineer each design to ensure that it is fit-for-purpose. Founded on the principle of engineering custom designed chutes, this is exactly what Weba Chute System does. “Numerous successful installations of Weba Chute Systems have proved that the correct application of our scientific approach to the dynamics of bulk materials handling can completely eliminate the problems associated with conventional transfer chutes, resulting in significant cost savings,” Baller says. To date, the company has engineered more than 4 000 transfer chutes, which are operating successfully throughout the global mining industry. “We consider a holistic design that not only focuses on the entry and exit points, but which also incorporates the control of the flow, volume and velocity of the material being transferred at all times,” Baller notes. By custom designing each transfer point, individual Weba Chute Systems can be configured to control the direction, flow and velocity of the calculated volume and type of material processed in a particular application. “The end result is a transfer point that substantially reduces expenditure in minerals processing,” Baller says. This is achieved through increased productivity and adherence to environmental regulations, in addition to decreased replacement and maintenance costs. “Conventional chute design is often associated with the uncontrolled discharge of bulk materials, which is linked to escalated maintenance and replacement costs. In addition, the presence of dust with conventional transfer points is an aggravating factor,” Baller says. Therefore, stringent environmental regulations must be put in place to control dust emissions. System design is undertaken using sophisticated 3D computer software, in addition to the relevant data received from the client. Weba Chute Systems are manufactured in an ISO 9001:2015 accredited facility, which ensures quality manufacture. Performance is guaranteed in accordance with operational and application parameters, ensuring the provision of a chute solution that works for every application. The long-awaited signing earlier this year of power offtake agreements with independent power producers is likely to boost Raubex Infra’s contribution in the renewable energy sector, according to managing director Ean Steenkamp. Raubex Infra had previously been involved in renewable energy projects as part of the government’s Renewable Energy Independent Power Producers Procurement Programme (REIPPPP). “We are looking forward to our increased participation in this exciting sector, making our expertise available to photovoltaic energy projects, concentrated solar power projects and wind energy projects among others,” says Steenkamp. Providing a range of infrastructure services from civils and electrical to telecommunications and rail, Raubex Infra specialises in executing turnkey projects. These are often in niche areas with demanding time constraints and technical complexities. Among its recent work in solar power was a contract to drill and cast 28,000 concrete piles for solar field foundations in the Northern Cape. The contract required regular, reinforced and drive piles, and consumed 3,000 m3 of concrete footing. The company was also responsible for the electrical, instrumentation and control installation on this project. This included almost 15,000 m3 of civils works and trenching, as well as laying and terminating 211,000 metre of fibre and ethernet cables. Medium voltage and low voltage cables were also laid and terminated. “Our experience allows us to undertake projects of various sizes in South Africa and across border,” Steenkamp says. 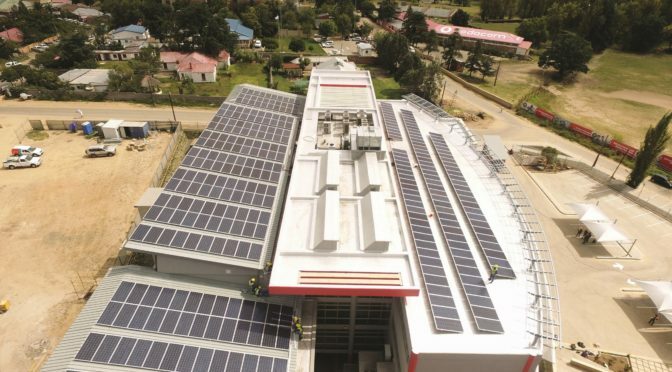 A recent project completed in Lesotho was the turnkey installation of a 105 kW rooftop photovoltaic (PV) system. This included mechanical installation of substructures, modules, cabling, inverters and control systems through to final commissioning. As an example of a smaller project, Steenkamp says Raubex Infra recently designed, supplied, installed and commissioned a 64 kW ground-mounted PV system in Boksburg, Gauteng. “Our capabilities and flexibility enable us to meet market requirements, and over the last couple of years we have been extensively involved in civils work including streets, sidewalks, bulk water facilities and telecommunications installations,” he says. Raubex Infra’s civils division is currently constructing the street network and water reticulation system for the second phase of the upmarket Woodlands Hills residential development in Bloemfontein. In addition to the civils services, the company will upgrade the provincial access road to facilitate direct access to the development’s Bergendal Gate. This project includes 21,000 m3 of mass earthworks, 22,000 m3 of layer works, and 6,300 m3 of trench excavation. Rocky conditions on surface required extensive blasting in the early months of the contract. Excavation is also necessary for slabs and drainage, and about 33,000 m2 of asphalt surfacing will be laid. Recent civils work has also included applying specialised and innovative solutions on road contracts, according to Raubex Infra operations director of the company’s civil and general infrastructure division, Cornel Strydom. One of these was the repair of a major sinkhole on the road between Danielskuil and Kuruman in the Northern Cape. Applying available technology innovatively, Raubex Infra’s civils division recently stabilised and rehabilitated the gravel road between Douglas and Campbell using a dust suppressant down to a depth of 150 mm. Aside from ensuring a safer more driveable road surface, this will reduce future maintenance costs. At a private game reserve in Limpopo Province, both paved and concrete roads have been constructed and cables laid for internet connectivity. 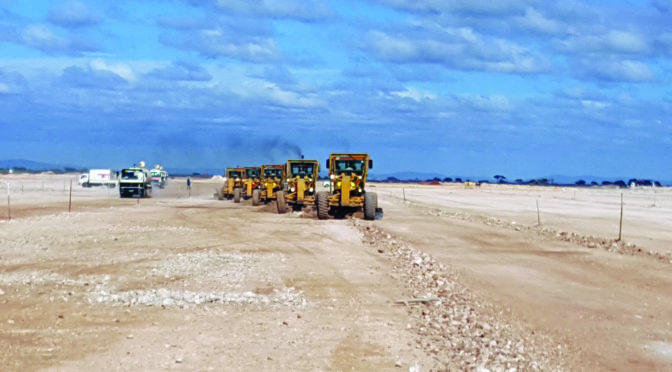 In the mining sector, the division conducted mass earthworks for a new run-of-mine tip structure for Tronox’s Namakwa Sands heavy minerals mine at Brand-se-Baai on South Africa’s Western Cape coast. This contract included the building of a 3 km trunk road to accommodate the new conveyor belt. Laying optical fibre cables for local and national connectivity networks is a vital specialisation of Raubex Infra, both within South Africa and in African countries. Danie Marais, operations director of the company’s telecommunications and special projects division, says work often takes them north of the border with extensive work carried out in Zambia, Zimbabwe, Uganda, Burkina Faso and the Democratic Republic of Congo. Completed contracts include the supply and installation of over 1,000 km of backbone network across Zambia as well as several smaller projects, including laying fibre cable in the Chingola-Solwezi region in north western Zambia. Closer to home, the division is currently rolling out ‘last-mile’ fibre to homes in Bloemfontein’s neighbourhood of Universitas and Waverley. Using dedicated and efficient trenching equipment, a narrow slot is created for the ducting minimising the impact on the roadway itself. A shallow gulley is then dug to channel the optical fibre from the road to the edge of the homeowners’ property. Raubex Infra also has extensive experience in permanent way (perway) construction in the rail sector including laying of ballast, sleepers and tracks. This division also has specialised teams doing overhead track equipment up to 50 kV capacity.